Rachel Flotard is front woman to a Seattle based indie pop group called Visqueen. 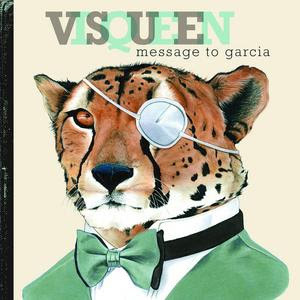 Their most recent album "Message to Garcia" was released this fall on Rachel's own label Local 638 Records. The album is really an epitaph to Rachel's father who died April 7, 2008. Rachel spent 7 years living with and care giving for her father who was diagnosed and ultimately died from prostate cancer. Their house was his hospice, and her album, though upbeat was really inspired by the journey she was on with him as he died. She told Ari Shapiro in an interview on All Things Considered, "Where I was, was in a hospital, or watching Raiders of the Lost Ark for the fiftieth time with my dad and making him a meal he couldn't keep down, this is where I was"
but I want it to be on my own. so long. And I'm sorry that it took so long. Finishing this song before her father's death, Rachel actually played it for him. She says in her interview with Ari, "I played it for my dad once.... not realizing that the lyrics were like 'you're going to die pal'... he was like "is that about me?" (she laughs as she finishes), "and I told him 'no' and I think we went upstairs and had pea soup." Ironic that the lyrics of the song say "I'm going to say things for the first time" implying an honesty and openness, that when it came down to it, was too difficult to acknowledge. Even the title of the album honors her father. There was an essay written by Elbert Hubbard in 1899 entitles Message to Garcia. The essay was about a solider tasked to preform a daunting mission by getting a message to a Cuban general named Garcia. The key is that this solider asked no questions, made no objections, requested no help, but accomplished the mission. It extols an attitude of working without complaining. Her father gave Rachel this essay when she was 18, and was constantly referenced by her father. Whenever facing challenges, he father would say, "Are you delivering it [the message to Garcia]" In other words, don't complain, you can accomplish this. Apropos then for a title of an album created in the grief and challenges of loosing a parent. She made no objections, kept working, and in this album, the mission was accomplished; a beautiful epitaph to George Edward Flotard Jr. I recommend listening to So Long from a link on the left at the All Things Considered interview. You can see an interview of Rachel and the band from CW11's Underground series below. Her father appears at mark 6:35 in the interview.